The Marvel comics villain tuned anti-hero is heading to theaters in October. 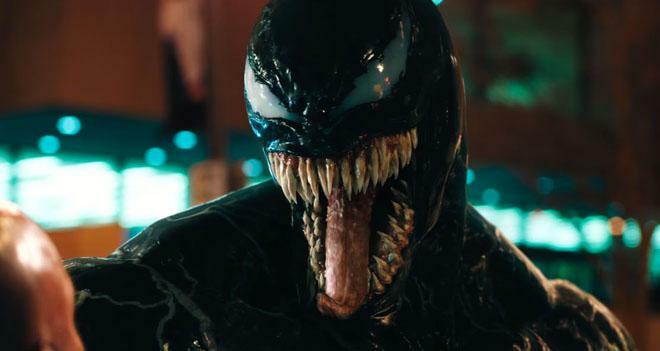 Sony has released a second full trailer for Venom, offering fans an extended look at Tom Hardy wreaking havoc in full symbiote mode as the title character. The movie comes from director Ruben Fleischer and is set to premiere on October 5. One of Marvel’s most enigmatic, complex and badass characters comes to the big screen, starring Academy Award nominated actor Tom Hardy as the lethal protector Venom. This film is not yet rated by the Motion Picture Association of America. Venom stars Tom Hardy as Eddie Brock / Venom, Michelle Williams as Anne Weying, and Riz Ahmed as Dr. Carlton Drake. The film comes from a script written by Scott Rosenberg, Kelly Marcel, and Jeff Pinkner. The character of Venom originated as a villain in the Spider-Man comic books, and previously made his big screen debut in Sam Raimi's Spider-Man 3 where he was played by actor Topher Grace. Though some rumors continue to hint otherwise, Sony has previously stated that this film will not be connected to Spider-Man: Homecoming or the larger Marvel Cinematic Universe. With that said, the studio does plan to use the movie to help kick off its own series of motion pictures based on supporting characters from the Spider-Man franchise, including Black Cat and Silver Sable. In addition, Sony is also set to release a new animated Spider-Man movie titled Spider-Man: Into the Spider-Verse on December 14, 2018. The CG film features the Miles Morales version of the character and comes from a script written by Phil Lord (The Lego Movie).